We are at the doorstep of a major USTreasury Bond breakdown. The TNX (10-year bond yield) is at the 3.0% doorstep, as 3.5% looms very likely in the coming months. A horrible threat of a 3.7% target is presented in the chart. A rising trend is seen in many characteristics that cannot be easily dimissed. The following graphic is an extremely powerful chart, thus the center piece of the article. If and when the breakout comes, it will make the Taper Talk backfire seem rather insignificant, as a gathering storm will hit like a financial hurricane on every continent. The Jackass is on record with a forecast of 3.5%, which remains in place. One must be patient to watch it unfold, since it can take months to unfold and to manifest itself. That is far more time than the nitwits who are quick to label it a wrong forecast call. But then again they are are loud unimpressive dullards who litter the audience, taking up valuable space. The USDollar control room at the infested USDept Treasury and the Banker Crime Syndicate at the US Fed Reserve will defend the 3.0% level to the death. A break above 3.0% toward 3.5% would bring about at least one big bank failure, force deadly dominoes of destruction, and reveal some more London Whale-type sightings with catastrophic losses. A very reliable reversal pattern is evident, the Cup & Handle formation, which indicates a breakout lift potential 1.0% higher. In my own past experience, the reversal pattern has been correct at least 80% of the time, but the timing of the breakout is always a challenge. The timeframe could be mid to late 2014, but it will take a long time to reach the indicated target level. Notice also the strong upward bias (tilt) in the entire reversal pattern, a rare feature seen anywhere. It means not only a reversal in progress, but a powerful one almost impossible to halt, since many underlying dynamos behind the forces. A USDollar currency crisis eruption could send the 10-year USTreasury Bond yield past 3.5% easily, then later toward the 4.0% level in a sudden burst. My gut tells of the system and the maestros losing control. It is not just the Gold market they are losing control, but the nemesis to gold, the USTreasury Bonds. The global effect of QE to Infinity and the fake Taper Talk, or trial balloon, has spooked the entire world. The necessary hyper monetary inflation has been accepted even though actual heresy. Its direct effect has been to undermine the USDollar currency in a grand enduring debauchery chapter. Its direct effect has been to lift the cost of food and energy, which strikes at the heart of foreign government stability. Its direct effect has been to motivate foreign parties to seek and to construct alternatives to the USDollar in both trade and banking. Its direct effect has been to change the perception of the US & UK leadership as criminal elements, who exercise hegemony for predatory purposes. They wish to remain in power, or as my friend UD says to retain stealing rights, so aptly. Witness a strongly applied classic recession factor, designed to dampen the rate rise trend. The bank syndicate prefers to permit a recession to persist and fester, so as to cause a reduction in final demand. They have spawned a currency crisis that is responsible to fuel the rate rise. The crisis touches all major currencies, not just the USDollar. It touches all currencies related to central bank management, whereby bond monetization is sponsored or at least USTBond monetization is supported actively. The wild card is seen with an interest rate swap derivative, designed as an elaborate control mechanism. No depth will be offered here on this hidden lever that produces artificial bond demand, and even results in what the deceived masses and deceptive controllers call a bond rally in a flight to safety. The interest rate derivatives are analyzed to some degree in every Hat Trick Letter newsletter report. In late 2010 and early 2011, the bond rally was contrived and triggered by these powerful derivatives. Put aside the control mechanisms to intervene in the powerful interest rate derivative. The 10-year USTreasury yield looks to be heading to 3.5% in a very clear chart, as human devices cannot stop natural forces. As investor lose more faith in the invincible USFed, as they anticipate a major train wreck in the bond market, they will take off their traditional pro-Fed positions and take the opposite side of the trade in defiance. 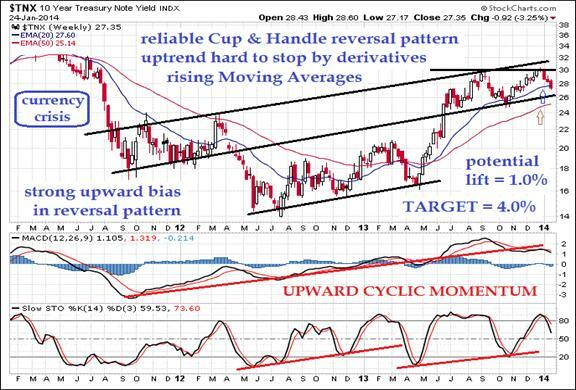 The Cup & Handle reversal pattern is among the three or four most reliable patterns in Technical Analysis. The right side handle has been taking shape since last September. Notice the rebuff by the moving average in October on the downside, then the rebuff at the 3.0% resistance line on the upside in January. Another knock of the door at 3.0% for the third time could be a charm, as more believers in the USFed weakness will join. The daily chart (not shown) has more support at the 50-day moving average (MA). The weekly chart shown above has support at the 20-week MA convincingly, as the rising TNX will come up to meet it. My forecast is for a jump in the TNX over the critical 3.0% level within a few hard fought months, with a 3.5% initial target, and a4.0% long-term target. Timing is difficult on reaching the target, especially given the extraordinary degree of corruption in all US financial markets and powerful USDept Treasury devices, not to mention all their corrupt cronies in other major central banks. The Jackass theory is that the derivatives used to restrain the rising rates might be broken, as a direct consequence of the QE bond monetization applied for way too long. Over two years of QE programs is an obscenity, a situation replete with heresy. The combination of permanent ZIRP (zero bound rate) and QE hyper monetary inflation has broken the USTreasury Bond complex. The evidence is ample. The dumping exercise by the various major creditor nations has added incredible strain. The new device of Indirect Exchange in established trend has also added strain. With the latter practice, nations pay for gigantic projects or outsized energy bills or massive tangible asset purchases with USTBonds stored in reserves. The US bond is the amply applied currency spent, no longer horded. The USFed must offset the considerable dumped sale of bonds by creditors. They use openly visible monetary inflation, plus hidden derivative tools that has lost their unchallenged power. The system is in breakdown mode. The USFed must offset the absent demand at the USGovt bond auctions. The USFed must offset the conversion of long-term bonds to short-term bonds. The USFed must offset the new pattern of Indirect Exchange on large scale deals. The USFed must offset the rising awareness that the COMEX is an empty mart with almost no gold in inventory, at a time when the GLD Fund has been raided of 35% of its gold bars by elite parasites, making victims of their incredibly stupid investors. The USFed must offset the preparation of the Gold Trade Settlement as the BRICS Bank converts to Gold Bullion to create the gold central bank repository. The USFed must offset the rising non-USD trade that employs intermediaries. The USFed must offset the growing perception that the USTBond has become toxic paper, while the central bank franchise system has failed on the open stage. Expect the derivative brake pedal to be applied for heavy pressure in restraint, motivated to save the entire system, the fiat paper system. It is based on faith, a commodity badly lost, soon totally lost. The syndicate in power wishes to first preserve their privilege to print themselves $trillions in grants, but second to avoid a hanging, or worse, to avoid a public spectacle of Nuremberg Banker Trials. The powerful restraint mechanisms might still have some gusto left, but my suspicion is that their tools and levers are broken. Since the London Whale sighting in June 2012, the Jackass has become highly suspicious of the interest rate derivative mechanism. My deep suspicion is that it has been critically damaged, and lost some (not all) of its power. The effect of the sequence of events is unclear on the derivative potency as a brake mechanism on rising rates. The secure income stream of the IRS tax funds might be diverted from usage in the control rooms that manage derivatives in key ways, making the device much weaker. The Chinese might have seized control of the income stream in a different derivative default, resulting in the loss of the JPMorguen HQ property complex. Two defaults are being manifested, both the USGovt debt default and the hidden JPM derivative made obvious by the sale of the Manhattan headquarters for half price. The Jackass smelled a collateral seizure amidst a large contract default. Imagine the biggest and most prestigious US bank, closely aligned with the USFed, doing the USDept Treasury bidding, managing the Interest Rate Swaps at the CIO offices, selling out to the Chinese, and the US public does not wonder what is going on. The depth of ignorance is indescribable and astonishingly unimpressive. The Chinese control the old JPM gold vaults, connected to the USFed. The United States is gradually to be transformed into a Chinese industrial colony, with control over Wall Street taking shape. The hints for the transition are evident in the captain log on the derivatives page. The reality of the Chinese buying the USFed at the termination of its 100-year contract seems to be coming into view. The Jackass has converted into the belief that JPMorgan is busy acting as procurement agent for the Chinese, to acquire as much Gold bullion at the lowest possible price for the longest duration allowed. The big conflict will come when the Chinese no longer are able to convert their USD shitpaper into Gold bullion. Only then will Beijing light the fuse, or dump on a mass scale, or introduce the Gold Trade platform, or pull the rug out from the USD, or all the above. QE to Infinity is being recognized, the Taper Talk widely seen as a ruse and propaganda to defend the broken USDollar, another turn in the road. The Geneva Iran Talks can be better described as the Petro-Dollar Surrender Talks, another turn in the road. The Boyz might misjudge that the derivatives can prevent a powerful breakout above the critical 3.0% and toward the initial 3.5% target, as the London Whale incident was a turn in the road. The Indirect Exchange seen in broad USTBond dumping is a new dangerous disruptive trend, the Rosneft buyout of the BP oil stake another turn in the road. The pension and bond funds as well as insurance sector demand higher bond yields for carry income, a breakdown coming. Market dynamics are out the window on a slowing USEconomy working to dampen rates. Look for higher rates even though economic growth data is lousy. Crisis times have returned, just like in summer 2008. A currency crisis is in powerful early stages, an extension of the enduring Global Financial Crisis that bank leaders had no desire in quelling for over five years running. The derivatives appear broken at a time when foreigners are seriously dumping USTreasury Bonds and the King Dollar is being dethroned on the global stage. A new alternative trade settlement system has two superpower sponsors in China & Russia. They will not be deterred. The Petro-Dollar is being dismantled, and an alternative system is being constructed. A quick update on derivative volume data from the Office of Comptroller to the Currency. The latest report indicates a moderate $10.4 trillion in OTC swaps added from 2Q2013 to 3Q2013, for which interest rate derivatives dominate. The new OTC Swaps in were somewhat evenly spread among the five largest players: JPMorgan, Citibank, Bank of America, Goldman Sachs, and Morgan Stanley. Back in the second half of 2010, the main bank to carry the OTC Swap water pails was Morgan Stanley. The Q2 placement of IRSwap contracts last spring slowed the rise in the USTreasury Bond yields. Expect the Q3 and Q4 data to show more of the same artificial demand interventions. Belgium increased its USTreasury holdings by $72 billion in a single year. The near 50% increase is more than the Japanese rise. Witness the new QE to Infinity back door window for hidden bond monetization. The slush fund is operated by the Euro Central Bank, which has offices in Brussels. The QE volume is far more than reported, with numerous alternative doorways seen. The global stage has new prominent players. The BRICS nations hold a huge block of USTreasury bonds collectively, led clearly by China. The pile of toxic paper can be used to gain advantage, earn sway in policy, coerce decisions, and pave the way for industrial colonization. The pile can conduct an open door America policy in reverse, from which to build industrial parks, and to funnel in large tranches of money. The creditor calls the shots, but must endure abuse and hidden terrorist devices. Outflows have intensified at domestic US bond mutual funds. An exodus is underway, as risk is not properly rewarded. A major blowup in the insurance sector is overdue, from inadequate carry income to finance routine payouts. It is late to enter the gold investment refuge, but never too late. The $400 to $500 per ounce discount offered by virtue of the 2013 gold market corruption, interventions, and propaganda affords an opportunity to those late entering the gold train with silver railcars. The USEconomy is running over the cliff, stuck in Never Never Land recently described in Reich Finance terms as the Non-Recovery Recovery. The advent of the Gold Trade Settlement system with its Gold Trade Note letters of credit, and strong Turkish bank intermediary role amidst the new Petro-Yuan standard with Russian supply support, along with the sturdy Gazprom and Iran Pipelines will make for a guaranteed rise to the $5000 gold level and $200 silver level. Gold will reign supreme again. The future of gold is assured, to be made crystal clear when the non-linear events unfold as part of the Global Currency Reset. It is better called, more accurately called, the Return of the Gold Standard via Trade. It will turn the Western bankers and their tarnished financial markets upside down. It will isolate their big insolvent banks as tall hollow reeds, sure to topple. It will introduce peer-to-peer payment systems that avoid the banks and the SWIFT weapons. For the naysayers, dim bulbs, and utter morons who dismissed many other correct forecasts, get back to me in a few years when the sunken bank vessels and collapsed market stages are part of past history, a shameful history. Let it be known that when this chapter is written by the new victors, the Iran Sanctions will be regarded as the greatest folly by the USGovt to turn the Gold Wars around, to assure an Eastern triumph. The sanctions served as motivation to construct the gold trade mechanisms in bypass. Soon the bypass systems will become the model of trade. The United States can join as a second citizen, since impoverished by a generation of predators and corruption and unsound money. If not, the US will fall into the De-Industrialized Third World. Out of the shadows, it will rain gold in trade again. "I commend the Jackass for being the most accurate of all newsletter writers. Others called for the big move in Gold right away, but you understand that the enormous fraud in the system needs to play out before free market forces can begin to assert themselves. You seem to have the best sources and insights into the soap opera that is our global financial system. Most importantly, you have advised readers to be patient, stay safe, and avoid mining shares like the plague. Calling the top in the USTreasury Bond (10-yr yield at 1.4% yield) stands out as a recent fine accomplishment. The Jackass understands the markets, understands the fraud, and also has the sources to keep him the most up-to-date on the big geopolitical and financial events and scandals. Few or no other writers have all three of these resources." Thanks Butterfly for the rest of this report.